Based on an extensive process that included a 4-H member design contest and voting input from 4-H members and adults, the California 4-H Youth Development Program has adopted new 4-H uniform guidelines. Implementation of these guidelines will begin July 1, 2015 and is expected to take several years for full adoption. See the California 4-H Uniform Guidelines and California 4-H Uniform FAQ for complete garment details and the transition plan to the new uniform guidelines. Official green 4-H hat branded with the University of California, Agriculture and Natural Resources (UC ANR) and the 4-H clover logo mark. These can be purchased through Leslie Carman 4-H Supplies. A uniform is not required for participation in any 4-H sponsored activity, event, meeting or occasion. Although members are not required to wear a uniform in the 4-H program, many members feel a sense of belonging when wearing the uniform. Fairs do not fall under the jurisdiction of the 4-H program and may require their own clothing for showing. Check with your local fair for specific details. The CDFA Fairs and Exposition Rule Book and the 4-H Youth Development Organization do not mandate a uniform or attire for judging. Check your local feed stores. The 4-H hat is a source of pride for the California 4-H Youth Development Program, as we are the only state to have such a 4-H club hat. Many members use the hat to display their achievement pins and to wear during fairs. A 4-H hat is NOT required for membership in the California 4-H Youth Development Program or for participation in any 4-H activity, event, or occasion. Official green 4-H hat branded with the University of California, Agriculture and Natural Resources (UC ANR) and the 4-H clover logo mark. These can be purchased through Leslie Carman 4-H Supplies. Youth who are currently senior level members may continue to use their white hat for the remainder of their 4-H career. Senior members may also convert to the green hat as they choose. It is expected that by July 1, 2020, all members will be wearing the UC ANR 4-H branded green hats. Where do I put my recognition and achievement items? Left side of hat - All-star, platinum, gold, silver, or bronze stars in front. Members may "cascade" the stars. Behind the stars are placed the junior/teen leader emblems and the Hi 4-H patch (in that order). 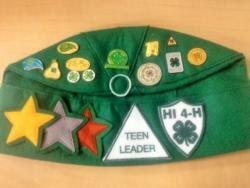 Right side of hat - year completion pin and stripe is earned for each year completed in 4-H. Officer title pins and 100% Attendance pins should align with the year the pin was earned. 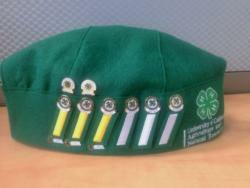 Year pins are fastened to the hat above the stripe, starting with the primary pins next to the 4-H clover. The 100% attendance pin, if earned, should be fastened to the hat below the stripe of the year that the pin was earned. Either side - Medals may be worn on either side of the hat, and placing them on the left is recommended.